This week's roundup covers play from the period of October 27 to November 2. For the full list of Red Sox prospects participating in off-season action, check out our Fall and Winter Leagues page, which will be updated continuously through the end of the offseason. It was a short week in the Arizona Fall League with the Fall Stars game taking place on Saturday before an off day on Sunday. Robby Scott (pictured, right) was the only Red Sox player to participate in the Fall Stars game, and he faced one batter to end the seventh and struck him out. Rusney Castillo made the Fall Stars team, but did not play at all this week after being deactivated with an injury. According to Baseball America's transactions log, Mike Miller has been added to the AFL, presumably to replace Castillo. At the plate, Deven Marrero had a quiet week, only appearing in two games and going 2 for 8. Sean Coyle continued his rough AFL season, appearing in four of the five games, and finishing 2 for 13 with two RBI, a stolen base, and four strikeouts. On the mound, Keith Couch struggled in his start on Friday, giving up four earned runs in four innings, allowing seven hits and two walks while striking out two. Aaron Kurcz saw action on Monday and got the win on Thursday, throwing a combined four innings, with one earned run on a solo home run, two walks, and five strikeouts. 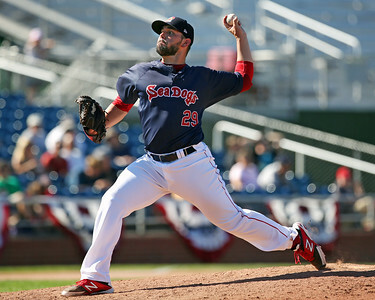 In addition to his one batter in the Fall Stars game, Robby Scott pitched three innings and gave up four hits while striking out four. Scott has now allowed only one run in 9 1/3 innings pitched to go along with 10 strikeouts. It was a very quiet week for Red Sox players in the Dominican. Keury De La Cruz saw brief action this week, going 1 for 2 with a walk. Free agent Corey Brown again saw the most action, going 2 for 6 on the week, with two runs, and at least a walk and strikeout in every game. Heri Quevedo threw 1 1/3 scoreless innings on Thursday with a strikeout and allowed a hit. Not one of Jose Vinicio, Aneury Tavarez, Manuel Margot, and free agents Jose Valdez and Miguel Celestino saw any game action this week. William Cuevas received a what is essentially a call-up and made his debut in the LVBP after having pitched for La Guaira's development program team so far this winter. He pitched 1 2/3 innings, allowing a hit, walk, and earned run with three strikeouts. Edwin Escobar also made his season debut on Wednesday, allowing the team's only two runs in only 1/3 of an inning. He saw action in two more games during the week without allowing a run over an additional 2 1/3 innings. Third baseman Carlos Rivero continued to rake this week. He played in the last three games of the week, going 4 for 12 with a double and home run. He is now up to six home runs in 64 at-bats, and his line now stands at .313/.389/.625 on the season. His 1.014 OPS ranks third among players with more than 40 at-bats. The Red Sox affiliate had a better week than last, going 2-4 including a 13-run offensive explosion on Tuesday. The offense was lead by infielder Carlos Tovar, who went 4 for 6 with a double, triple, and stolen base. After this week, he is now second in the league in total bases while hitting .344/.397/.590 with five doubles and two home runs. The offensive explosion was backed up by a strong start from Carlos Garcia, who threw five innings allowing only one run while striking out six. Victor Acosta has been playing outfield this winter after seeing time mostly in the infield for the Red Sox, and has hit very well, posting a .381/.458/.524 line. The two best pitchers thus far for Boston's affiliate have been Yankory Pimentel and Mario Alcantara, and both had solid appearances again this week and secured two of the team's three wins this week. Pimentel pitched on Thursday, throwing 4 1/3 shutout innings without allowing a hit to go with one walk and four strikeouts. Alcantara, who is admittedly on the older side for the league, pitched on Friday in the second game of a doubleheader and threw five innings with six strikeouts, allowing six hits and two earned runs. The league opened on Thursday and four players have already seen action. Free agent Dayan Diaz is the lone pitcher to appear thus far, and he pitched on both Friday and Saturday for Santurce going 1 1/3 innings, striking out one and allowing one hit. Infielder Ivan De Jesus, who is also a free agent, played in two over the weekend for San Juan and went 1 for 4 with four walks. Outfielder Henry Ramos saw the most action thus far, playing in all three games thus far for Caguas, but has gotten off to a slow start. He finished the week with 15 at-bats but only two hits (both doubles) and five strikeouts. Finally, Jeremy Rivera had only one at-bat for Mayaguez and did not reach base. Of note, Christian Vazquez is not expected to join San Juan until later on in the season. The ABL opened Thursday as well, but none of the Red Sox have seen action to date. Stefan Welch is on the Adelaide roster, and Daniel McGrath will pitch for Melbourne. Mike McCarthy is also expected to pitch for Perth later in the season. Photo Credit: Robby Scott by Kelly O'Connor.